J.S. Pate and D.B. Layzell, Energetics and Biological Costs of Nitrogen Assimilation. C.P. Vance, Symbiotic Nitrogen Fixation: Recent Genetic Advances. A. Kleinhofs and R.L. Warner, Recent Advances in Nitrate Assimilation. P.J. Lea, S.A. Robinson, and G.R. Stewart, The Enzymology and Metabolism of Glutamine and Glutamate. J.K. Bryan, Recent Advances in the Biochemistry of Amino Acid Biosynthesis. K.R. Schubert and M.J. Boland, The Ureides. A.F. Tiburcio, R. Kaur-Sawhney, Sr., and A.W. Galston, Polyamine Metabolism. J.W. Anderson, Sulfur Metabolism in Plants. Each chapter includes references. Index. 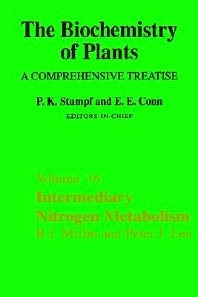 This volume covers the most significant advances of the last ten years in understanding intermediary nitrogen metabolism in plants. The eight chapters comprise aspects of nitrate and nitrogen assimilation, symbiotic nitrogen fixation, glutamine and glutamate enzymology, amino acid biosynthesis, ureides, and polyamine and sulfur metabolism. The volume emphasizes molecular and genetic advances as well as biochemistry and physiology. Intermediary Nitrogen Metabolism will be of interest to all plant biochemists and molecular geneticists who study nitrogen metabolism, enzymology, and amino acids. Researchers, students, and lecturers in plant biochemistry, plant physiology, botany, plant molecular biology, and genetics. University, government, and industry laboratories and libraries. Institute of Environmental and Biological Sciences, Lancaster University, U.K.